"EVERY MAN HERE HAS LOOKED INTO HIS OWN SOUL - ABOUT TIME YOU DID, TOO." 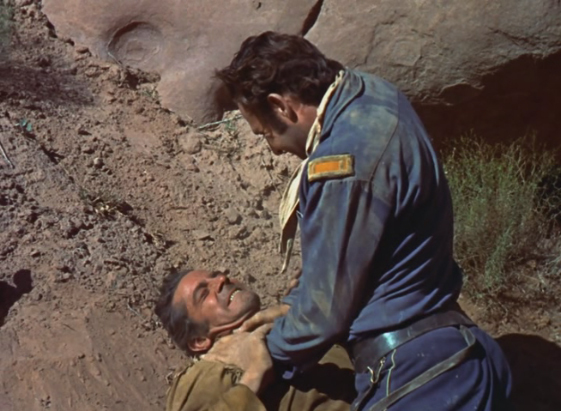 Cavalry officer Brett Halliday (Dana Andrews) is facing a court-martial for treason over his alleged defection to the Native American Ute tribe that has been making raids against US soldiers. Captain Harper (William Talman) is a play-it-by-the-book soldier who is charged with delivering Halliday to the local fort for court martial. But the pesky Utes launch a bloody attack and force the survivors to flee for their lives in frail boats via the mighty rapids of the Colorado River! 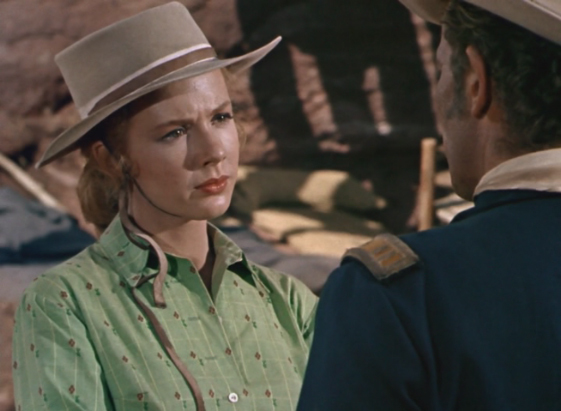 Among the survivors is the beautiful Laura Evans (Piper Laurie). She is the daughter of the recently-slaughtered commanding officer of the fort, and also is in love with another survivor, Lt. Ford (Rex Reason), who reveals himself to be a no-good. Their only hope of survival is to tackle the unforgiving stretch of water whilst holding off the pursuing enemy. But can they survive each other first? 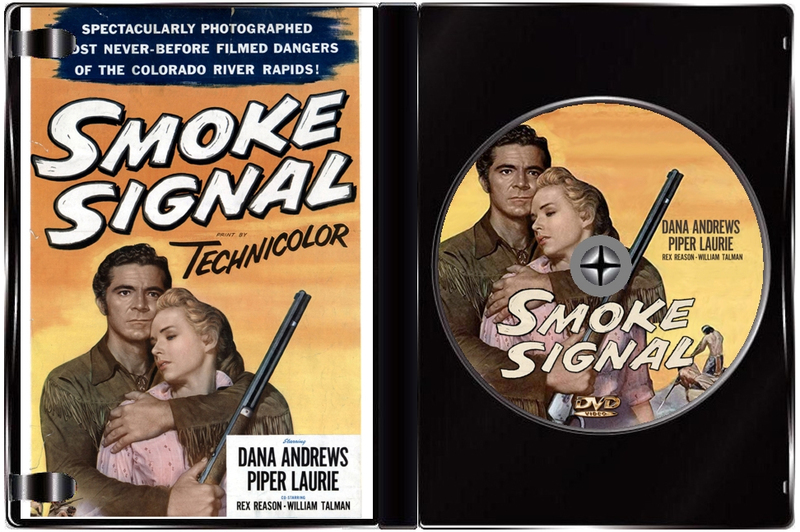 Smoke Signal is directed by Jerry Hooper and co-written by George F. Slavin and George W. George. 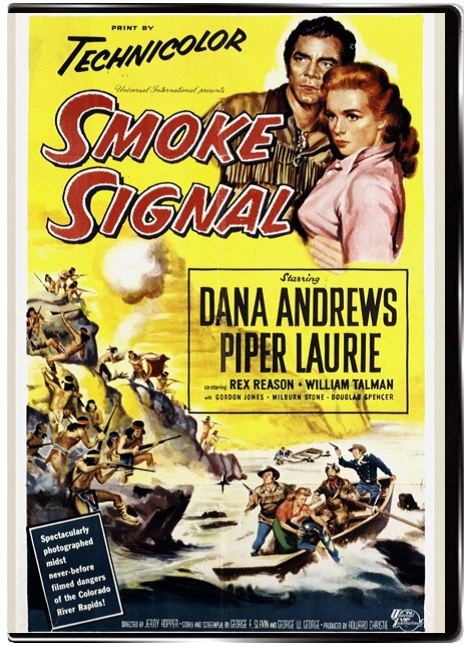 It stars Dana Andrews, Piper Laurie, William Talman, Rex Reason, Milburn Stone and Douglas Spencer. 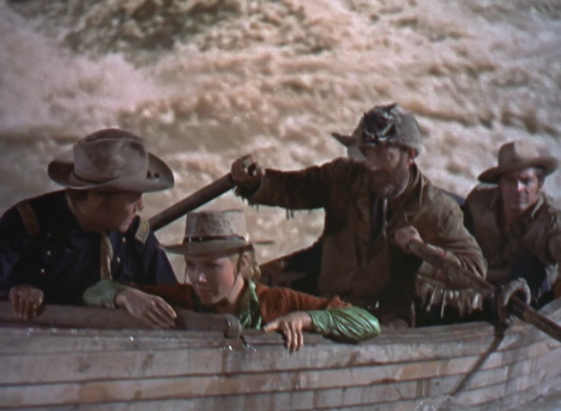 A Technicolor production that's primarily filmed at the Grand Canyon of The Colorado, cinematography is by Clifford Stein and musical supervision is provided by Joseph Gershenson. The story is a safe one as it focuses on a fractured group dynamic having to come together in order to survive the terrain and hold off the enemy pursuing them. The group consists of a bull-headed Captain (Talman), soldiers with prejudice, a pretty lady (Laurie), a trapper (Spencer) and a prisoner (Andrews), the latter of which is a despised "Indian Lover" because of his having been married to an Indian woman and therefore lived with the Ute tribe. Many human traits and qualities will be tested on this journey, the narrative strong enough to warrant interest in seeing how it will all pan out.